On Thursday 18 April, following the success of Go North East's first Chatty Bus Day back in January, the region's biggest bus company is bringing its second instalment to the people of the North East on some of its busiest routes. Hop on board and and save with our £10 Family Day Ticket. From 7 April 2019, there will be changes to some services in Western Gateshead and Derwentside. Ahead of International Women’s Day (Friday 8 March 2019), Go North East has announced a series of appointments to the company’s senior team, boosting its pool of inspiring female talent. This National Apprenticeship Week (4 - 8 March 2019), the region’s biggest bus operator, Go North East is celebrating its young talent making a big impact – including two industry award-winning apprentices. To mark the start of National Apprenticeship Week 2019 (4-8 March), former apprentice Colin Barnes - now engineering director at Go North East, shares his views on the value of apprenticeships, from his own experiences to heading up the company’s award-winning bus and coach engineering and maintenance scheme. 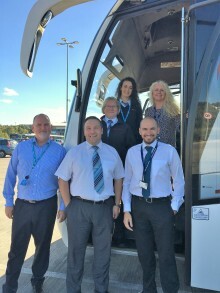 Following an announcement by the Buses Minister Nusrat Ghani MP, bus operator Go North East and Nexus the Tyne and Wear Passenger Transport Executive, have been awarded funding in the latest round of the Government's Ultra-Low Emission Bus Scheme. 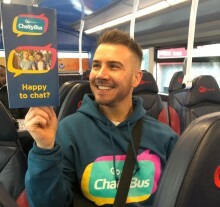 Around 250 people took advantage of a new initiative to combat loneliness this week (Tuesday 29th January 2019) as Go North East’s ten-strong team of ‘chatty champions’ boarded over 30 buses travelling across the region in a bid to get people talking. Amid research highlighting three in 10 Brits go at least one day a week without speaking to anyone and in a bid to support North Easterners who maybe battling with loneliness, Go North East is introducing ‘Chatty Bus Champions’ to three of its busiest routes on Tuesday 29th January. A Go North East bus has been transformed into an inspirational learning environment, to encourage students with special educational needs from County Durham to read for fun and improve their literacy skills. With its bulging awards cabinet almost full to the brim, Go North East is making room for two more trophies this month after securing accolades at the North East England Tourism and UK Bus Awards. Put your travel worries behind you. The region’s largest bus company, Go North East, has won three awards recognising its dedication to developing a skilled workforce through apprenticeships at Gateshead College’s annual Edge Awards. Special buses from Gateshead, as well as Angel and Coaster.